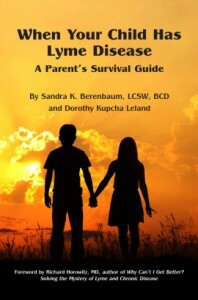 Sandy Berenbaum, LCSW, BCD, Lyme-Literate Psychotherapist · Our new book for parents is now available! Our new book for parents is now available! A few years ago, Dorothy Leland and I were discussing the plight of families with Lyme disease, particularly the predicament faced by parents from the time their child’s symptoms begin, through the hurdles they face throughout treatment and beyond. We decided to write a book to help parents at just about every step of the way. We are very excited to announce that our new book, When Your Child Has Lyme Disease: A Parent’s Survival Guide, is now available from Amazon.com in both paperback and Kindle formats. For additional information and updates on the book, please visit our publisher, Lyme Literate Press.